Two people, including a six-year-old boy, remain in hospital after being injured when a tour vehicle overturned and fell into a river at a theme park. The incident happened at 1245 BST on Tuesday at the Diggerland complex in Langley Park, near Durham. The all-terrain articulated vehicle was giving 18 passengers a tour of the site when it slipped down a bank, landing on its side in the water. The Health and Safety Executive has started an inquiry into the incident. The child is still being treated at the University Hospital of North Durham for a serious foot fracture. A 33-year-old woman also remains in hospital suffering from a serious chest injury. In all, 12 people were taken to hospital after the vehicle landed in the River Browney. 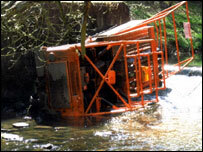 Diggerland has three sites; in County Durham, Strood in Kent and Verbeer Manor at Cullompton, Devon. All the parks feature rides and exhibits of mechanical digger vehicles. The company's promotional literature says children can drive or be given rides in different types of construction machinery. A Durham Police spokesman said: "As part of its normal route the vehicle went down a steep hill, but at the bottom of the 20-metre hill it failed to negotiate a bend. "It toppled over a drop of several feet into the River Browney, landing on its side in the shallow water. "The driver escaped unhurt and all his passengers were wearing seatbelts, which ensured no-one received life threatening injuries." Diggerland said in a statement: "An incident occurred where a tracked all-terrain vehicle deviated from its designated route and slid several feet into the River Browney landing on its side in shallow water. "The vehicle was giving rides to the public and unfortunately 12 people suffered minor injuries and were taken to a local hospital. "Diggerland very much regret this unfortunate incident and are cooperating fully with the Health and Safety Executive who are investigating the incident."